President Donald Trump drew attention this week to the increase in state proposals requiring public schools to offer Bible literacy classes. Among the states considering bringing the Bible back to public classrooms is Florida. 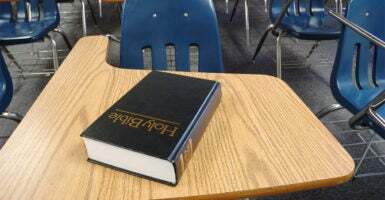 Under the bill, “specified courses relating to religion, Hebrew Scriptures, & [the] Bible” would be required offerings as electives in every school district for grades 9-12. Students would study religion “objectively,” including Hebrew Scripture, the Old Testament, the New Testament, and a course on all three. If Daniels’ Bible literacy bill passes, it would go into effect July 1. Other states that have introduced similar bills this year include Indiana, Missouri, North Dakota, Virginia, and West Virginia, according to the American Civil Liberties Union, which is challenging these efforts. In North Dakota, lawmakers proposed a bill to allow public high schools to offer a Bible studies class as an elective within its social studies curriculum. The ACLU deems it “unconstitutional,” arguing the bill needs to include other viewpoints. State Rep. Aaron McWilliams, R-Hillsboro, a co-sponsor of the bill, told Fox News that he would be in favor of including the Quran or any other religious text in an elective class from a historical and sociological perspective. The ACLU used the same argument when targeting Bible literacy classes in Kentucky permitted by a 2017 bill signed into law by Gov. Matt Bevin, a Republican.